Investigator a.k.a Gator came to KyEHC after retiring from racing with 33 lifetime starts and over $81,000 in earnings. Gator has a laid back personality and is easy to handle and groom. 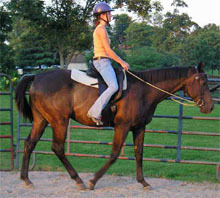 He is quiet under saddle and will make someone a great pleasure or trail mount. For more information on Gator or any of the other horses at the Kentucky Equine Humane Center, visit /redirect.php?location=http%3a%2f%2fwww.kyehc.org%2f.